"Vesuvius Volcano - Looking at this currently dormant crater, you will be looking at one of the most dangerous volcanoes in the world..."
As your Mediterranean cruise ship pulls into the port of Napoli and you look to your right, in the Bay of Naples, you will see a big bluish cone rising in the background – Vesuvius volcano. It’s hard to believe that this tame looking mountain, whose slopes are now covered with vineyards and shrubs, caused the dreadful Pompeii eruption that wiped the lost city of Pompeii off the face of the earth. Looking at this currently dormant crater, you will be looking at one of the most dangerous volcanoes in the world. Namely, Vesuvius Volcano lies only 9 kilometers (5.6 miles) away from the city of Napoli. Which means, around 3 000, 000 people live nearby – it’s one of the most densely populated areas in the world, right here within the radius of a potentially lethal blast! Vesuvius, the Pompeii volcano, is thought to have gotten its name either from the Greek word “unquenchable” or, some say, from the Latin word meaning “the one who lightens”. Back in the time when people respected the elements, the spirit of places and things more, this mighty mountain was respected as a divinity… one of the genii. It was also worshiped as Iovvi Vesuvio – one of the powers of Jupiter. The picture of Vesuvius volcano appeared in decorative frescos of many lararia or household shrines of the ancient city Pompeii. The cone of Vesuvius volcano we see today was produced during the infamous eruption of 79 AD, the eruption that caused the destruction of Pompeii. Due to many smaller eruptions since, the height of the cone constantly changes, at the moment it is 1,281m (4,202 ft). an active volcano although it doesn’t produce more than steam from the vents at the bottom of its crater. Actually, it is the only volcano on the European mainland to have erupted within the last hundred years. 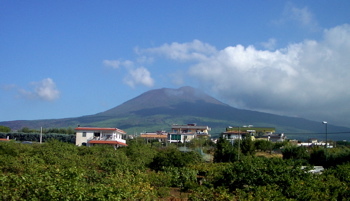 The other two major active volcanoes, Etna and Stromboli, are both on islands. The mountain of Vesuvius Pompeii volcano started forming 25,000 years ago and it was formed as a result of two tectonic plates colliding, the African and Eurasian plates. Since then, it had erupted many times, of which we have records back to some 200 years before the big Pompeii eruption… the earlier eruptions were mentioned by Strabo, Plutarch, Vitruvius and others. After the big Vesuvius eruption in 79 AD, the volcano erupted at least 42 times, the last eruption being the one in 1944 when the volcano destroyed many of the American airmen’s (340th Bombardment Group) aircrafts as they were stationed in Pompeii. Today, there is an emergency plan set up for the evacuation of the people living in the zona rossa (red zone), which is 600,000 people living in the area which is at the greatest risk of the pyroclastic flows. It would take about 7 days to carry out the plan.